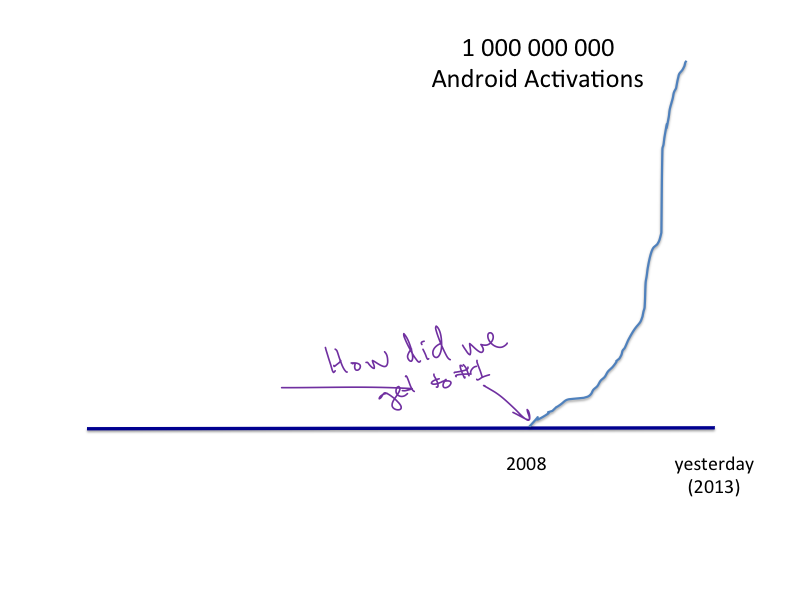 Billionth Android device was activated. Microsoft bought Nokia's phone business (for a relative pittance). The long-awaited HTC Dream, the first commercial handset running Google’s Android operating system, will be coming to T-Mobile as the G1 for $179 on October 22nd. 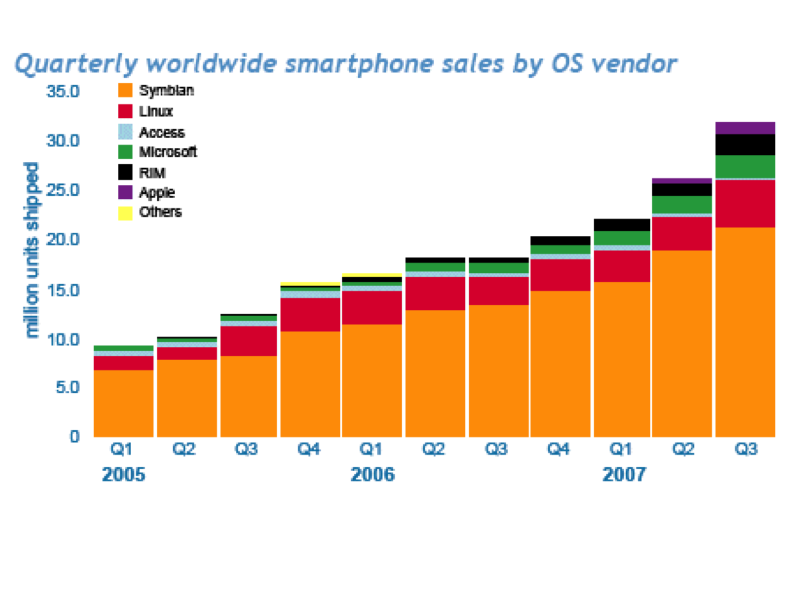 Featuring a 3-inch touchscreen, internet navigation buttons and a full QWERTY keypad, the smartphone market has finally broken free of Symbian, Windows Mobile and the sweet clutches of fruit companies. 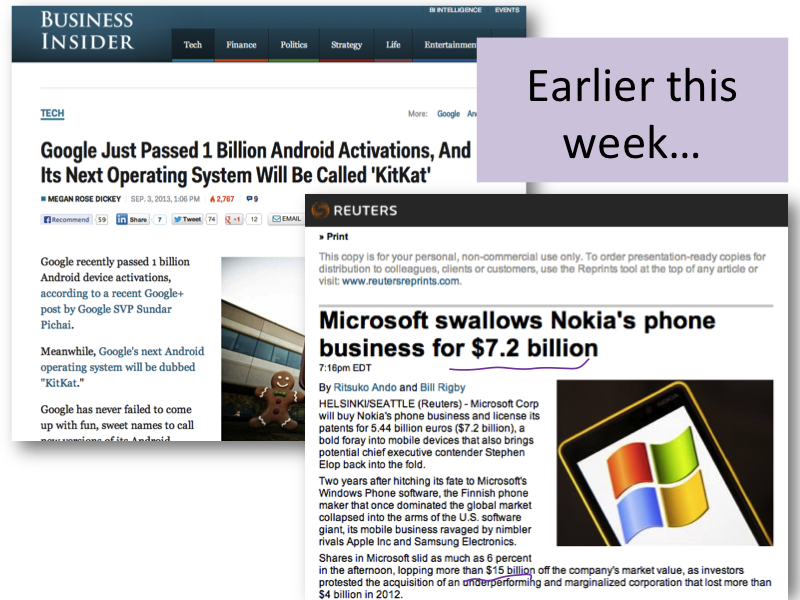 Microsoft paid $7.2B ((all of) Nokia was worth about $40B five years ago) and lost $15B in market value on the news. 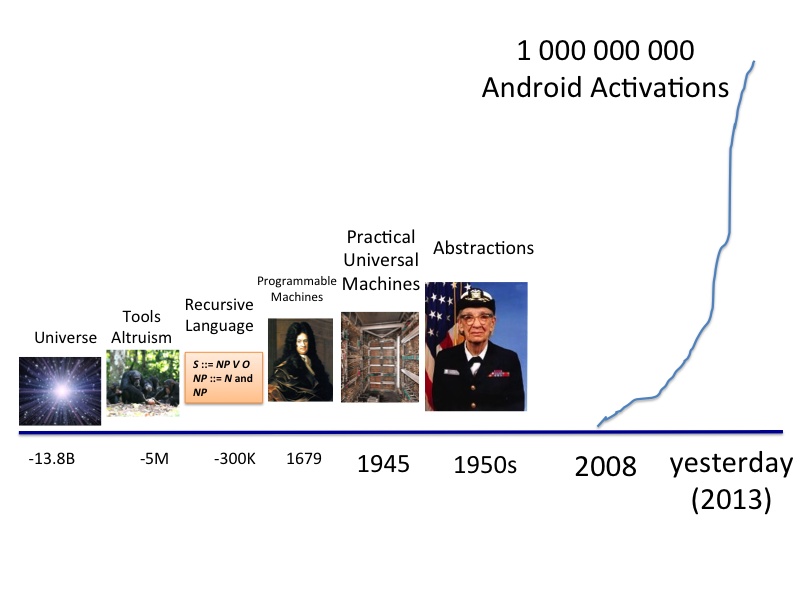 One Billion Android activations in less than five years! How did we get to the first one? How far back do we need to go to understand it? Buildling complex systems requires working in large teams. Insects figured that out long before primates evolved. 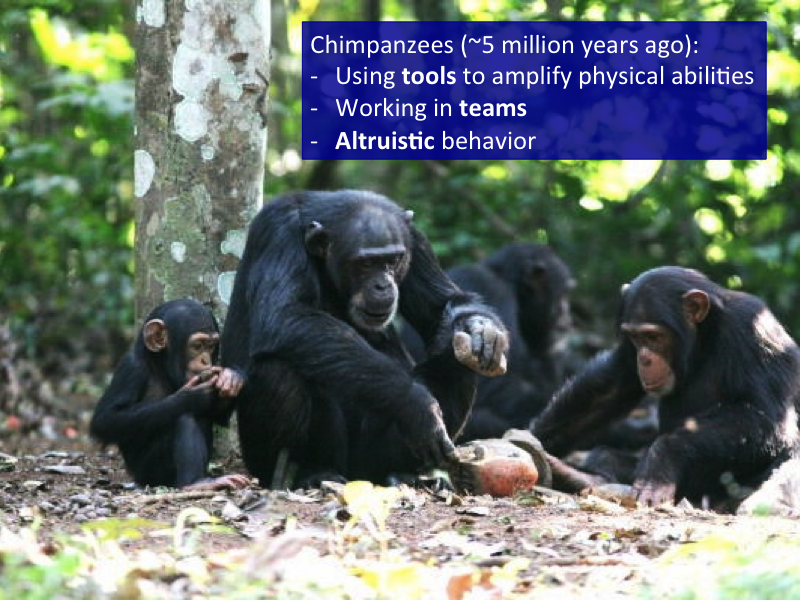 Bigger brains and language enabled us to communicate and share knowledge and operate in larger groups, and get better at dominating our environment. Eventually, we got so good at it to develop cooking so we didn't need to spend most of our time chewing, and agriculture so we didn't need to spend most of our time chasing food around and could invest in permanent settlements, growing to civilizations large enough to require complex taxation systems (and motivating the development of the mathematics needed to implement them). By a few thousand years ago, we had gotten so absurdly and unimaginably efficient as a species that we could afford to have a handful of members who were completely unproductive - not producing a single calorie of food, or even ruling over others who did. So rich, by the 1500s, in fact, to be able to support people with the two most unproductive roles imaginable: professors and lawyers! Our next major advance was done by someone who was both: Gottfried Wilhelm von Leibniz. By the 1600s, humans had started to make significant computing machines. 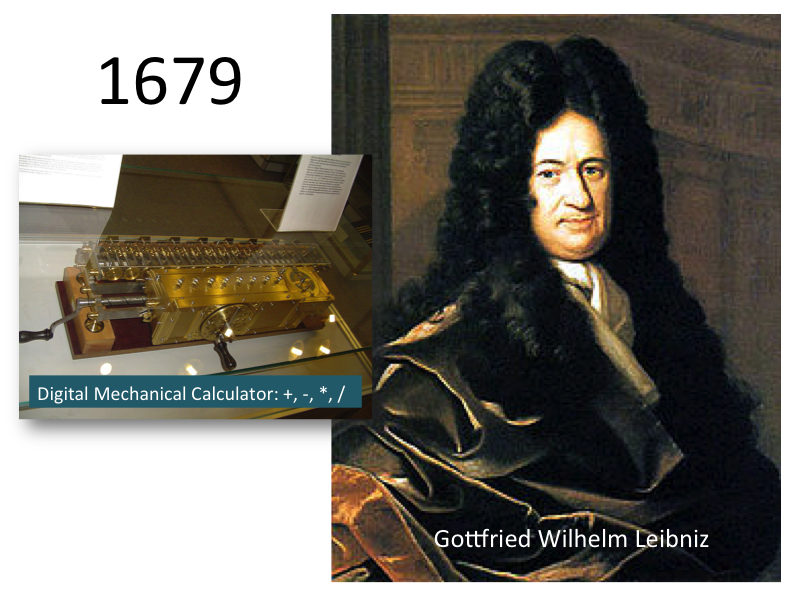 Leibniz built machines that could do encryption and perform all the basic arithmetic operations. 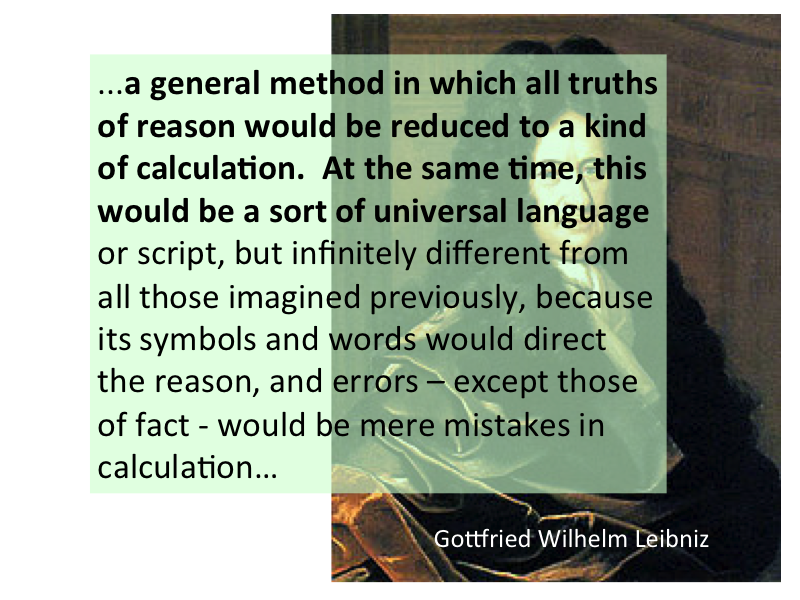 A few other computing machines were built around this time (e.g., Blaise Pascal's and Wilhelm Schickard's, but it was Gottfried Leibniz who made the huge intellectual and pragmatic leap to see the computing machines could be universal. Although 1679 seems like a long time ago, its only 15 academic generations (which happen much more quickly than biological ones). 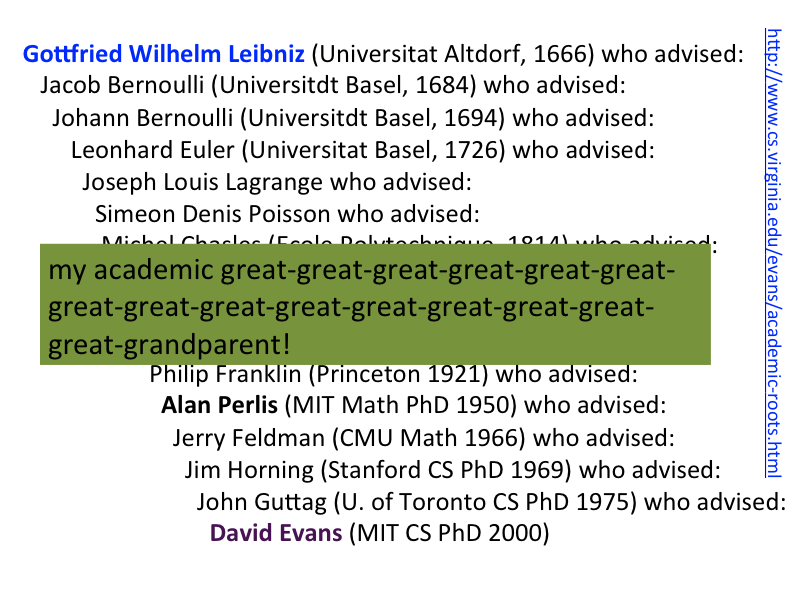 I'm honored to have Leibniz as my academic great14-grandparent! 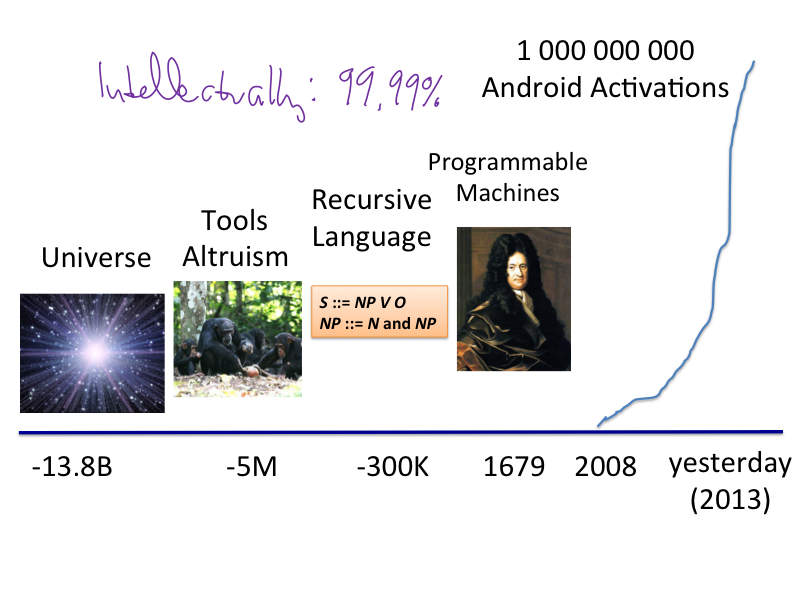 At this point, we're intellectually 99.9999% of the way there to the first Android activation. 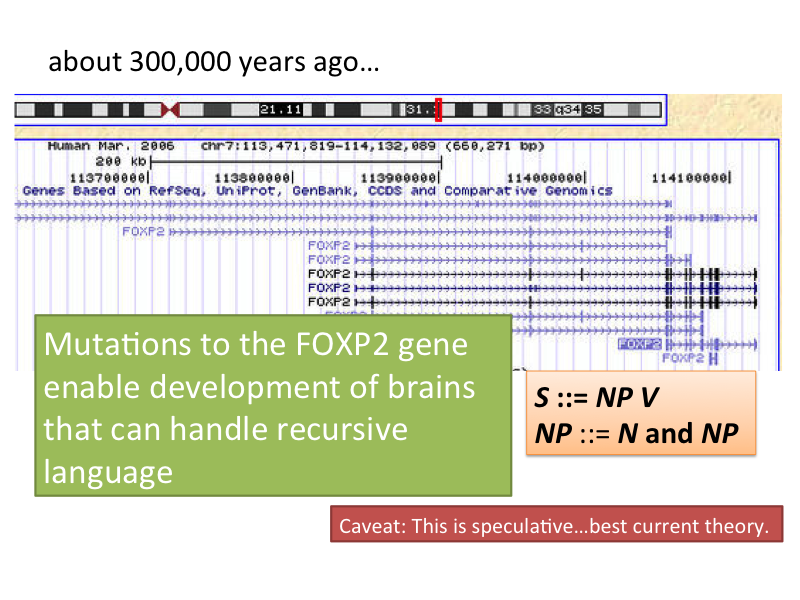 (Okay, I'm counting getting from the origin of the universe to human language as about 99.99% of the way.) Actually achieving Leibniz' vision of universal computing machines, though, will take a few hundred more years of advances in physics, machinery, and mathematics. 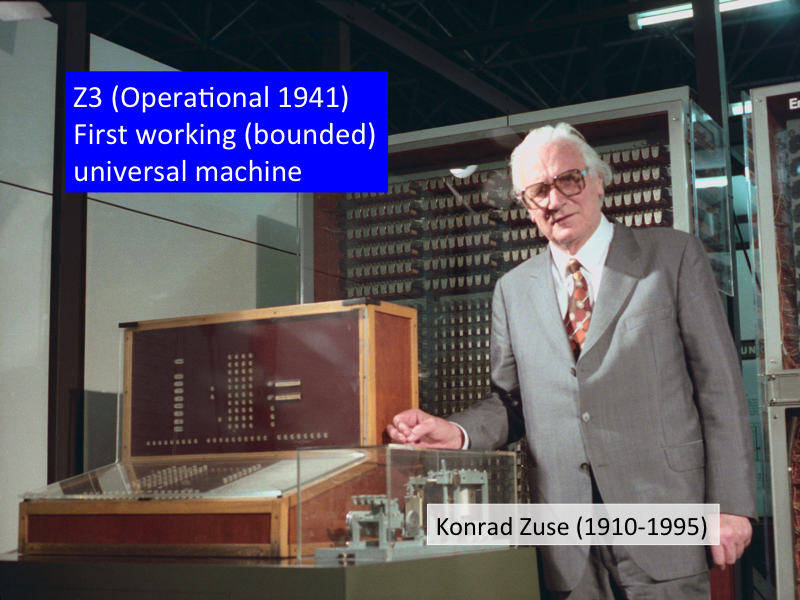 By 1941, Konrad Zuse had built a working "Turing-complete" computer. (Of course, we can't really talk about any physical machine as being truly universal, since its capabilities are limited by finite memory and operating time. But, extrapolating Zuse's design to a machine with unlimited memory and time, it would be a universal computing machine.) 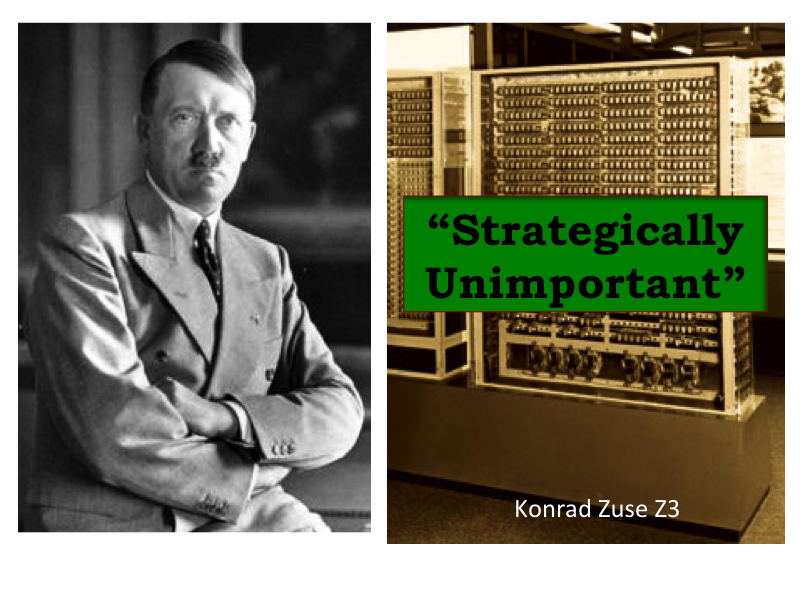 Zuse was not an overt Nazi, but was working in Berlin funded by the Nazi government. 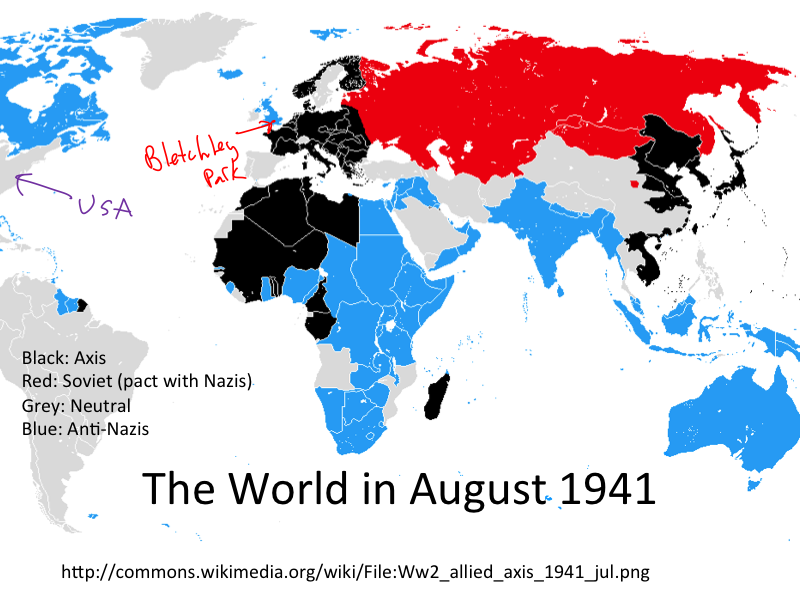 For context, this is what the world looked like in 1941. Other than that little spec of blue in the North Atlantic, pretty much the rest of the then-industrialized world was either controlled by the Axis, in a pact with them (Soviet Union), or at best neutral (USA). A few thousand people were working at a small manor and dozen hastily built huts at Bletchley Park, midway between Oxford and Cambridge, building machines that could do operations useful for cryptanalysis, but nothing close to the capabilities of the Z3. 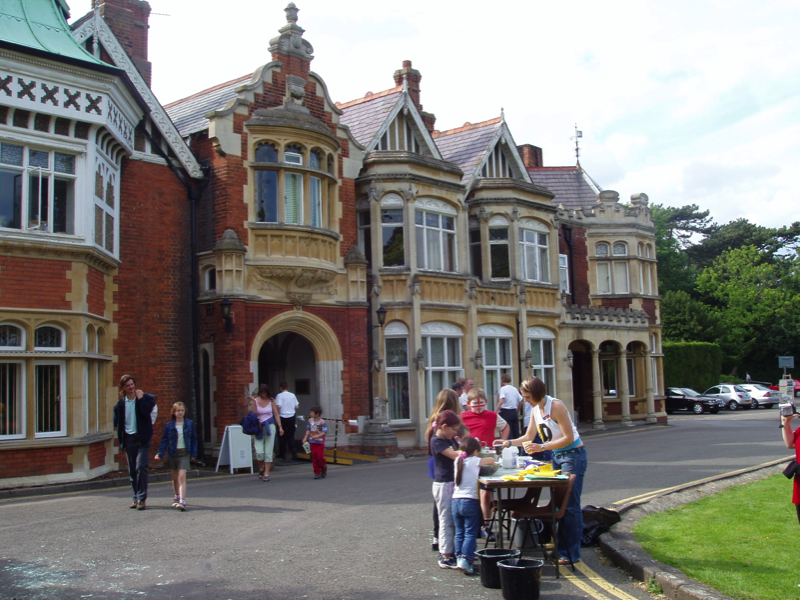 This is Bletchley Park, now a wonderful museum. See more pictures from my 2004 visit. 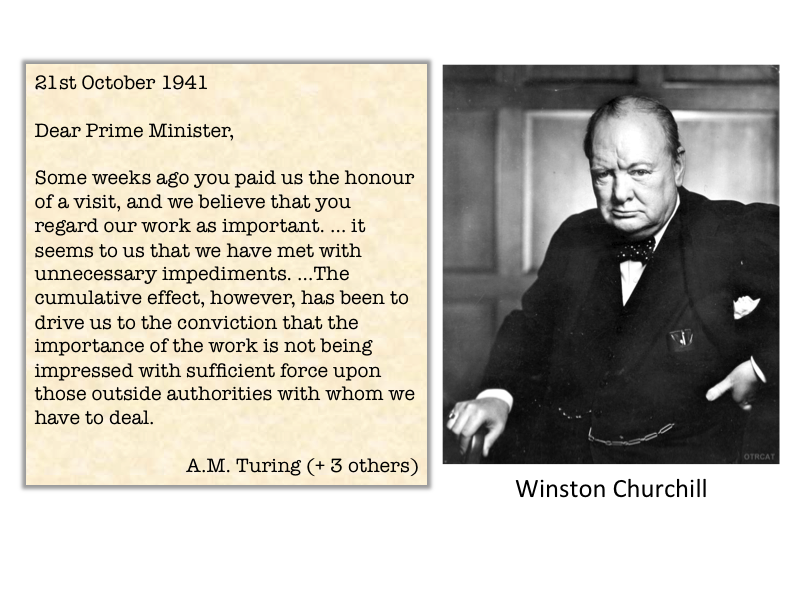 A group of four people working there, including most famously Alan Turing, circumvented the chain of command and wrote a letter directly to Prime Minister Churchill. The letter explained some of the impediments to their effective work and asked for help with resources (e.g., "We are intercepting quite a substantial proportion of wireless traffic in the Middle East which cannot be picked up by our intercepting stations here... Owing to shortage of trained typists, however, and the fatigue of our present decoding staff, we cannot get all this traffic decoded. This has been the state of affairs since May. Yet all that we need to put matters right is about twenty trained typists."). Anyone who wants to see how to write an effective funding proposal should stop now, and go read the entire two page letter. 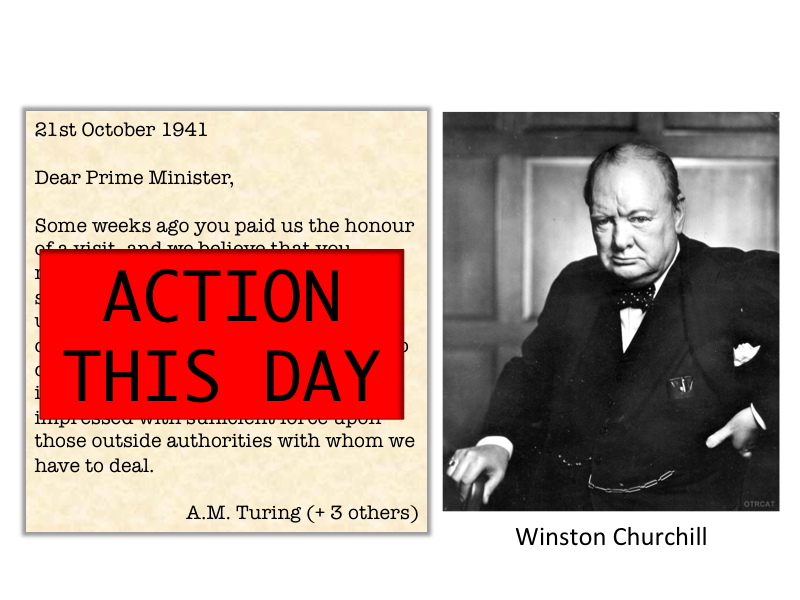 Churchill's response to Turing's letter: ACTION THIS DAY. Turing and colleagues got everything they needed. 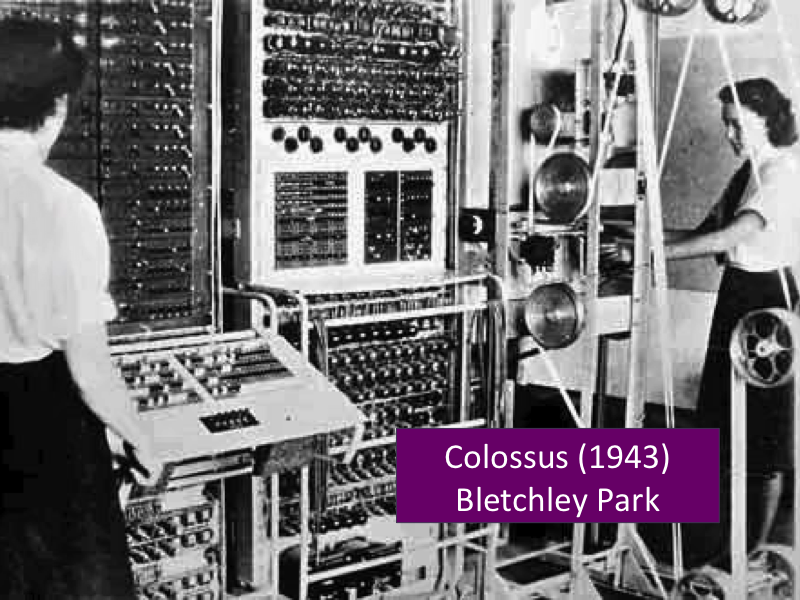 By 1943, Bletchly Park had built Colossus, a (somewhat) programmable computing machine used to break the Lorenz cipher the Nazi's used to communicate between their major conqured capitols across Europe. 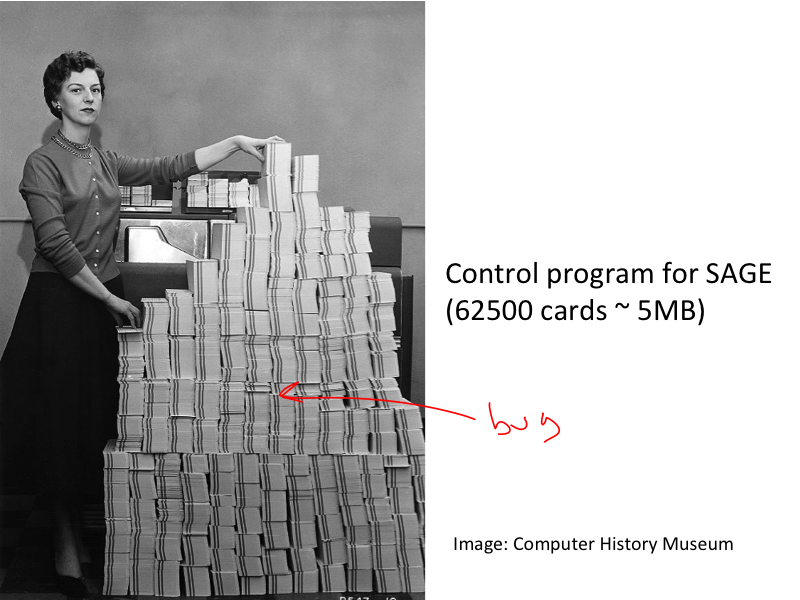 For more on the amazing story of Colossus, see this segment from my Applied Cryptography class. By the end of World War II, a number of programmable computing machines were under development, including the ENIAC, designed by John Mauchly and J. Presper Eckert at the University of Pennsylvania to calculate artillery tables for the US Army. Although there are many possible definitions of an operating system, we defined an operating system (strictly) as a system that both (1) provides abstractions to hardware resources, and (2) manages how programs use those resources. 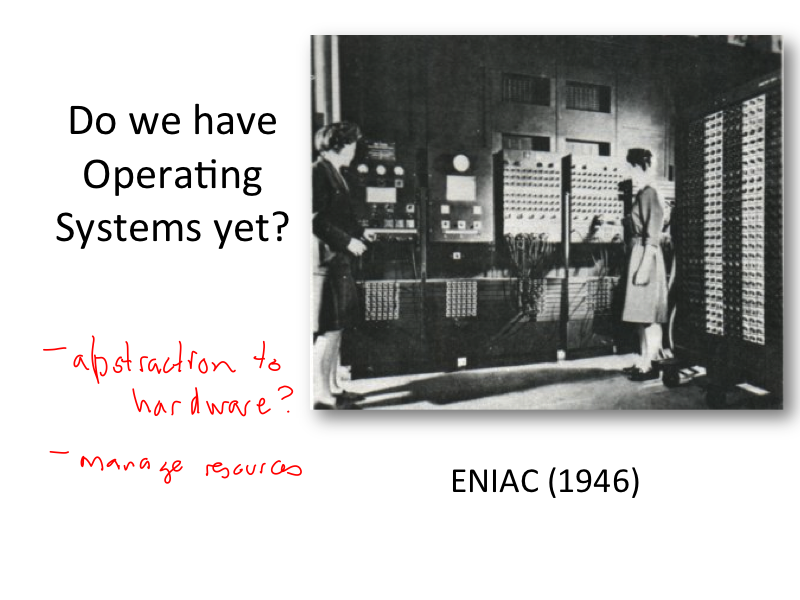 To decide if the ENIAC had an operating system, we need to understand how it was programmed. 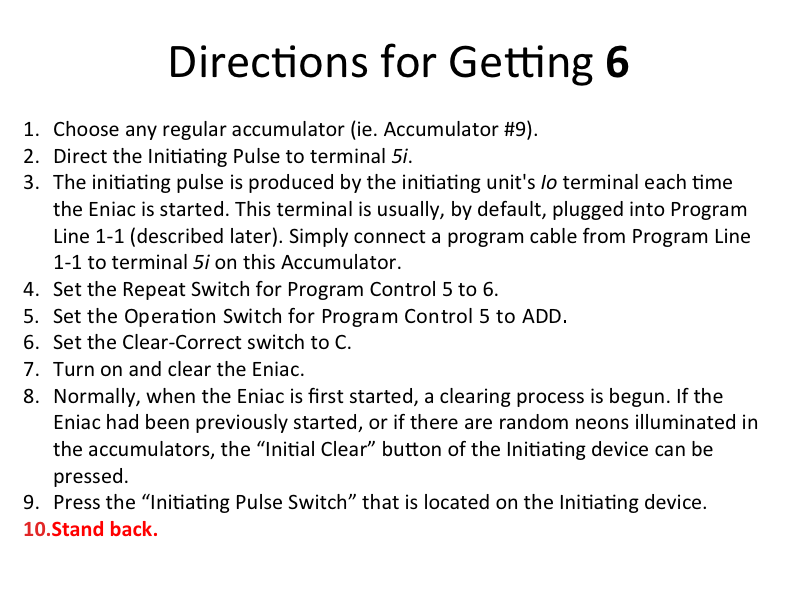 Here's how to assign the value 6 to a memory location in the ENIAC. Whether or not something provides an abstraction is a fairly fuzzy question, but you can be pretty confident that if programming the hardware requires the operator to stand back, it does not provide an abstraction to hardware resources. The "great Hop forward" in programming abstractions, was the idea that instead of controlling the hardware directly, we could write programs (that is, compilers) that produce the machine-level programs for us given programs written in a higher-level language. 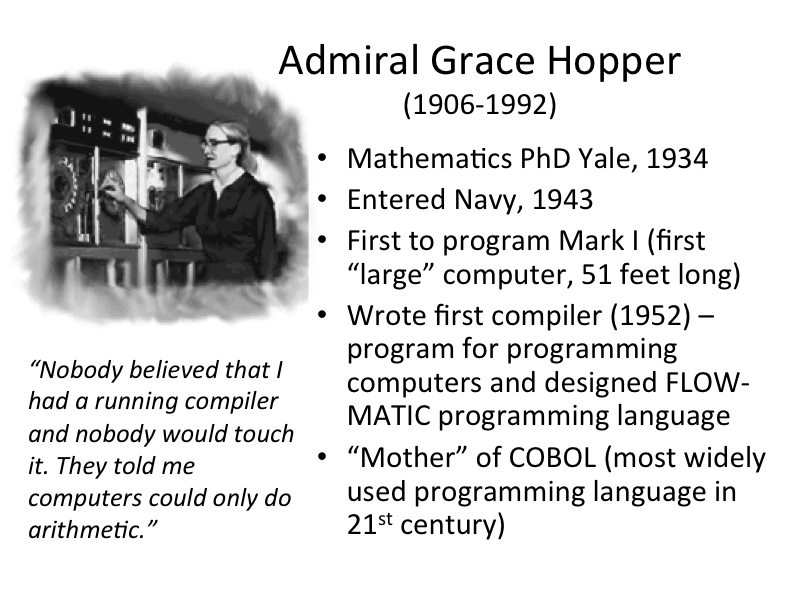 Admiral Grace Hopper was amazing. 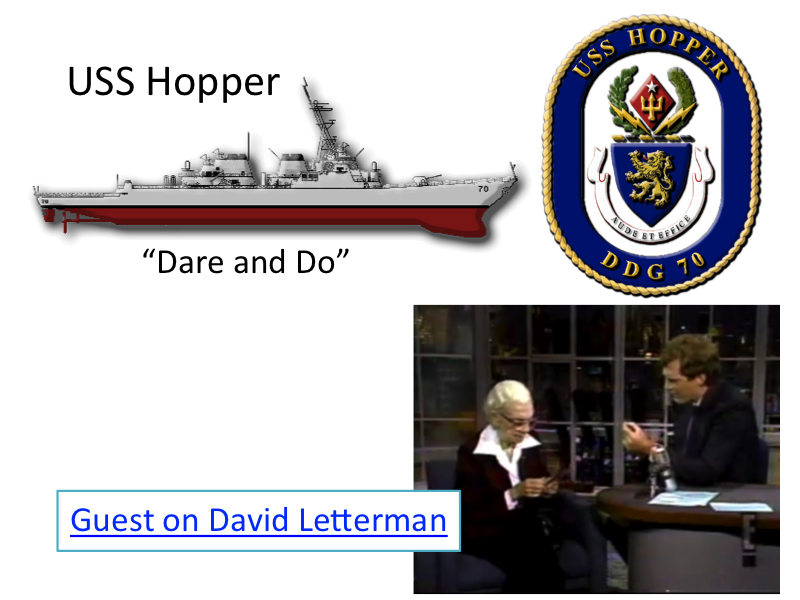 Check out her showing David Letterman what a nanosecond is. Definitely making progress, but not quite ready to activate Android. In particular, we don't yet have an operating system by our definition: need to manage resource use, not just provide abstractions. 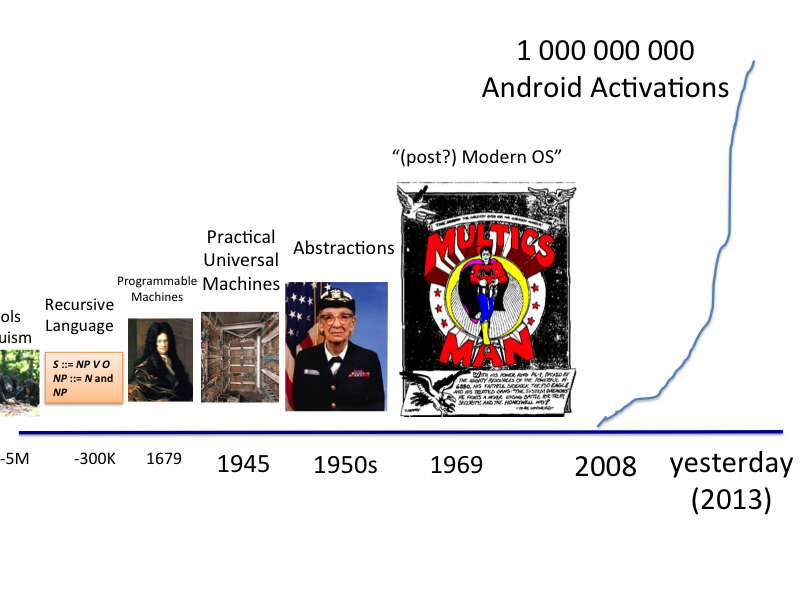 It took one more imminent threat to survival to accelerate the progress toward our first Android activation. 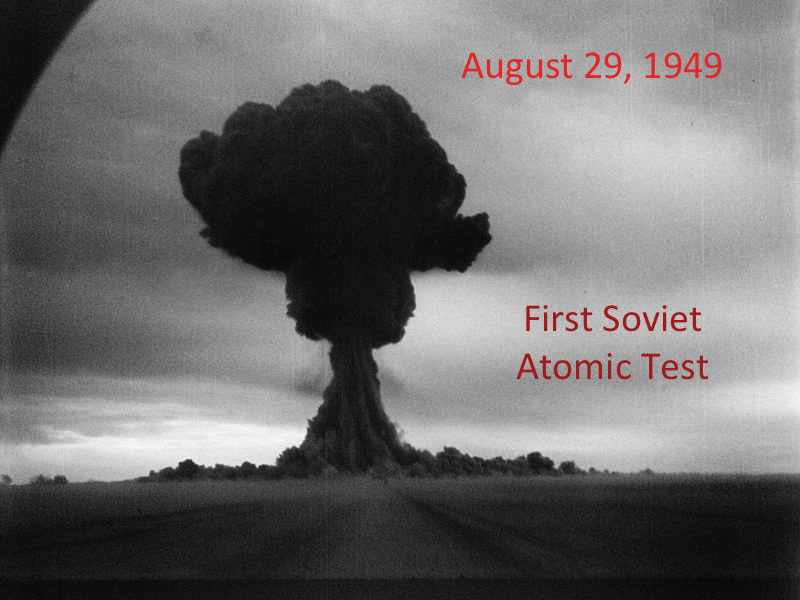 In the days before ICBMs, the military's main fear was that a single bomber could fly over the Arctic to reach a US city and obliterate it with an atomic bomb. 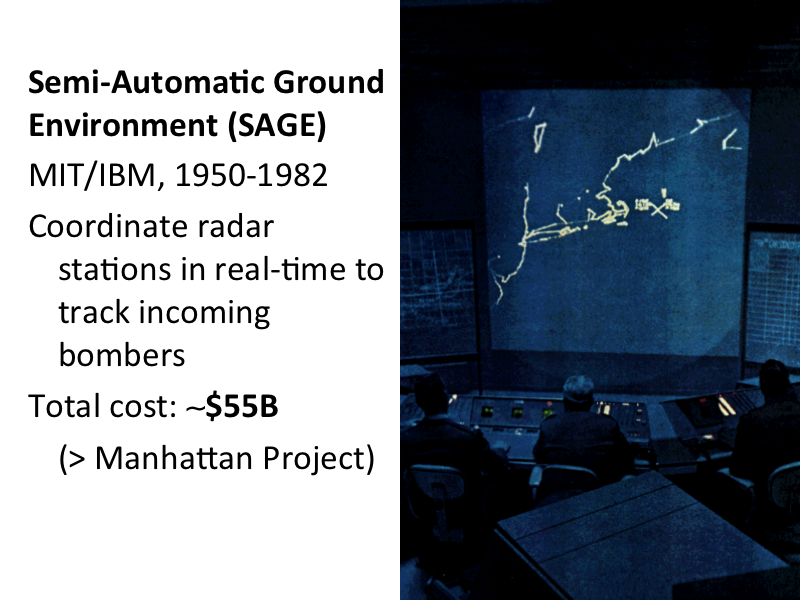 Attempting to prevent this required radar far more sophisticated than anything developed during WWII, including the ability to track a single incoming bomber across multiple radar stations. This required really powerful computing, where speed was of the essence. 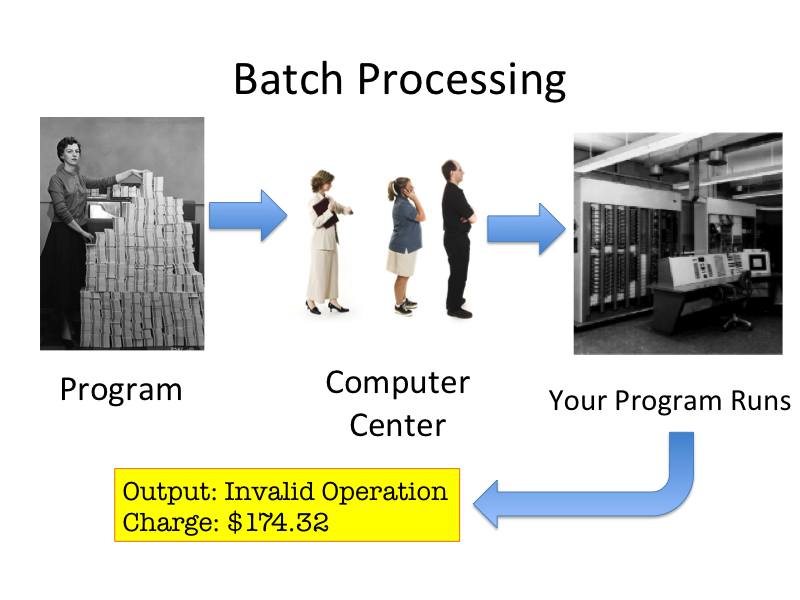 Batch processing runs one program at a time. An operator sets up the program in the computer and starts the program, which has full control over all the machine hardware until it finishes. The operator collects the result, and sets up the computer to run the next program. So, we need a way to stop wasting all those valuable computers sitting around waiting for tapes to spin. The solution is to run another program instead of just waiting. To do this we need a real operating system. 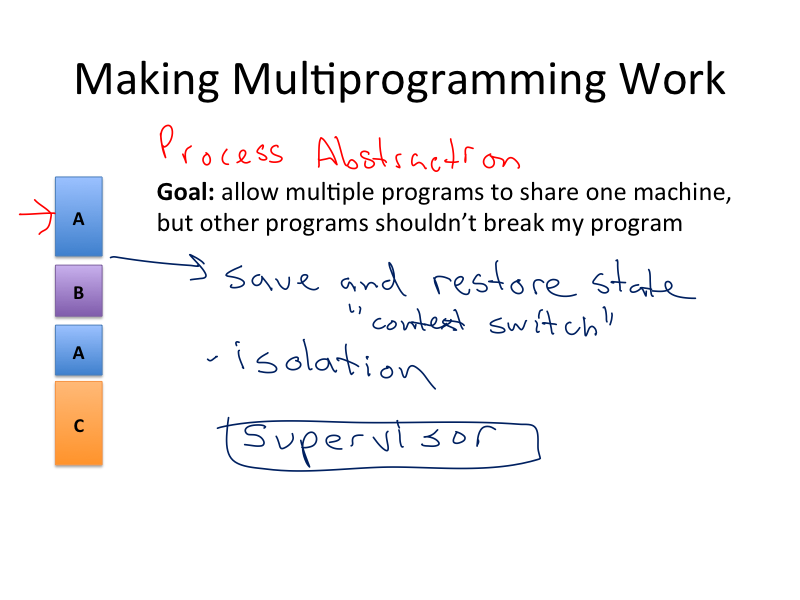 We need a way to allow multiple programs to share one expensive computer, but provide each program with the process abstraction, that it owns the whole computer, and is running on it just like it would be if it were running as a batch process. 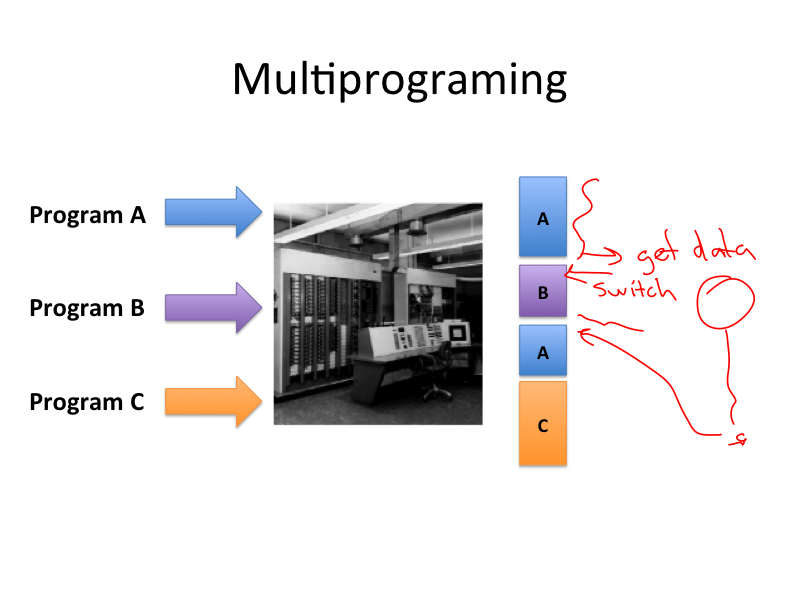 If we are going to run multiple programs on one computer without them interfering with each other, we need one special program that can control how the other programs run. This kernel has special access to the hardware and must be able to do some things the other programs cannot do. 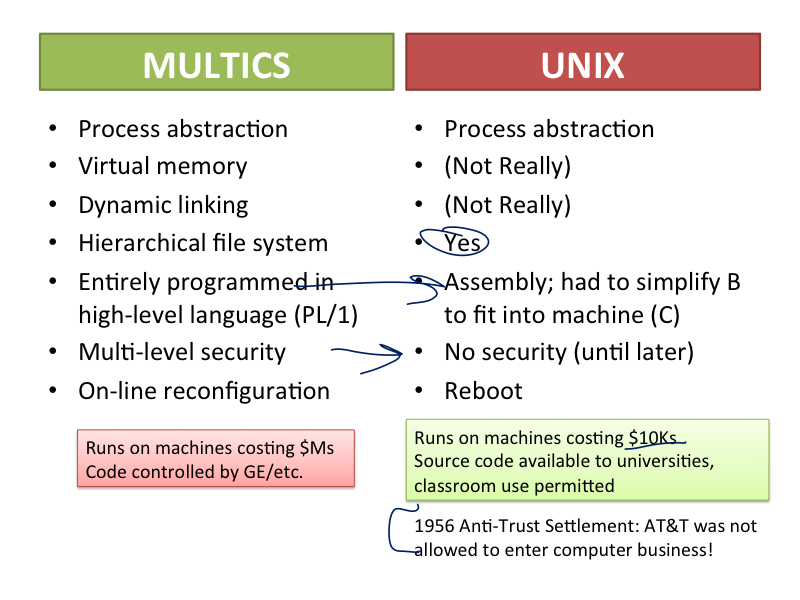 The first really significant operating system to provide a real process abstraction was MULTICS, developed starting in 1964 at MIT (with lots of partners). 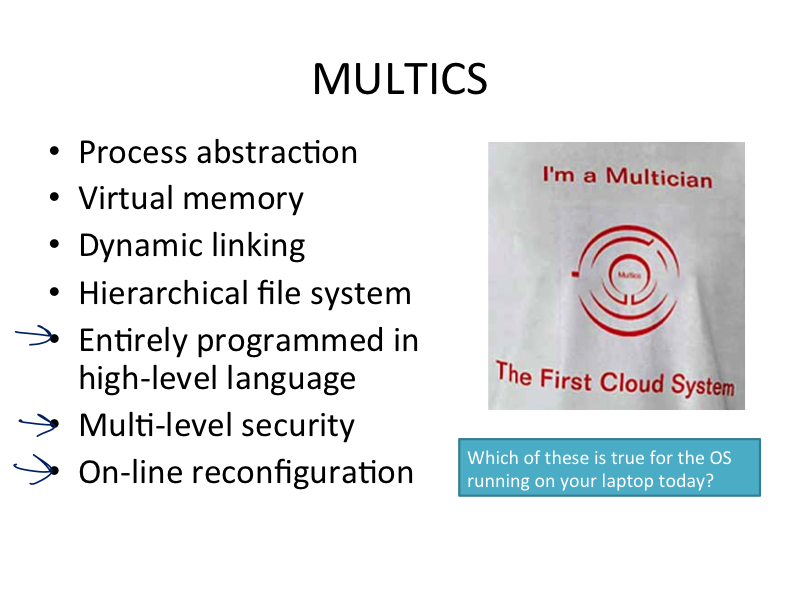 In many ways, MULTICS was arguably better than the operating system you are running today to view this page. 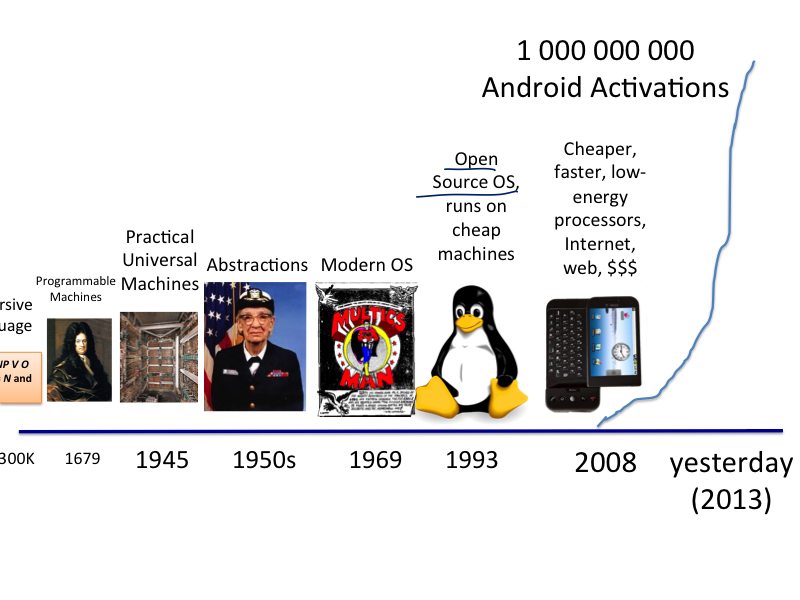 So, why did it take forty more years before the first Android activation? 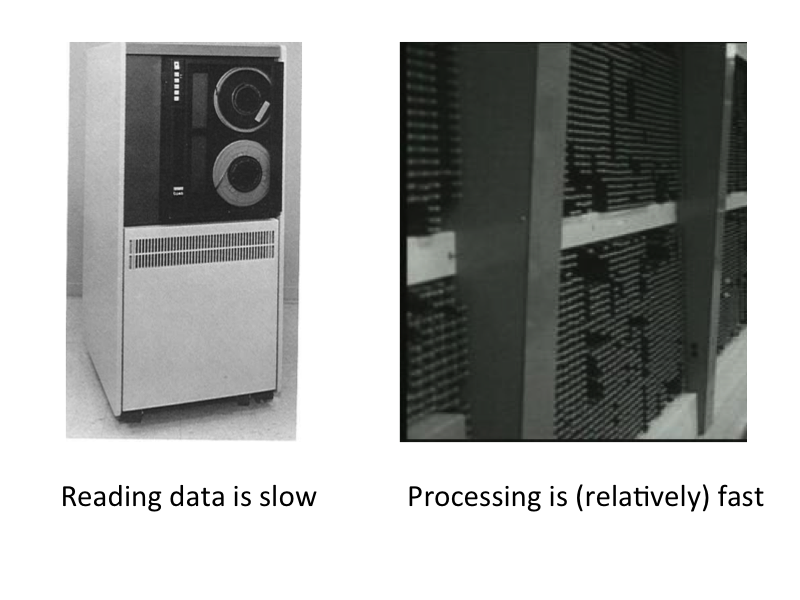 If you wanted to run MULTICS in 1969, you needed a truly astounding amount of memory! 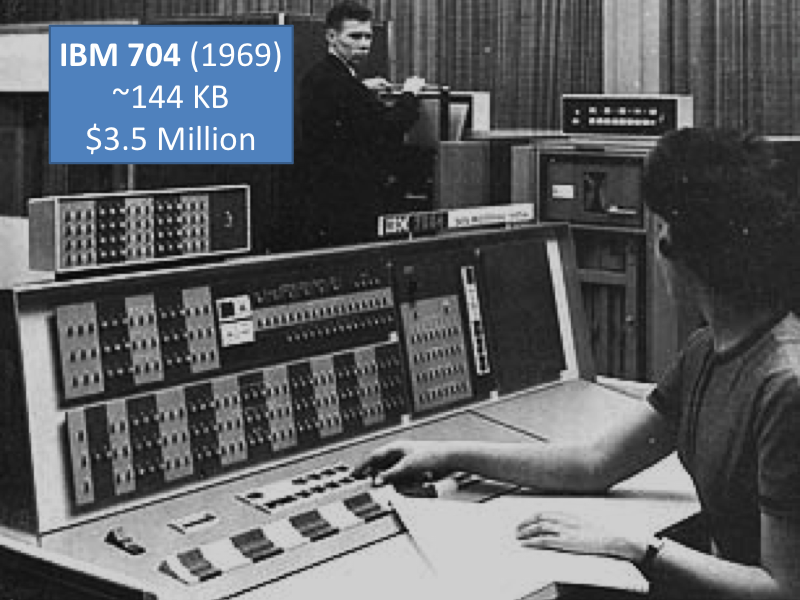 We're talking scores of kilobytes (nearly half as much memory as the picture of this slide!) In 1969, this cost about $3.5M (that was back when a million dollars was still a lot of money). Smaller computers, though, were starting to get cheap enough that big enough companies with national monopolies could even afford to have ones just for engineers to play with. 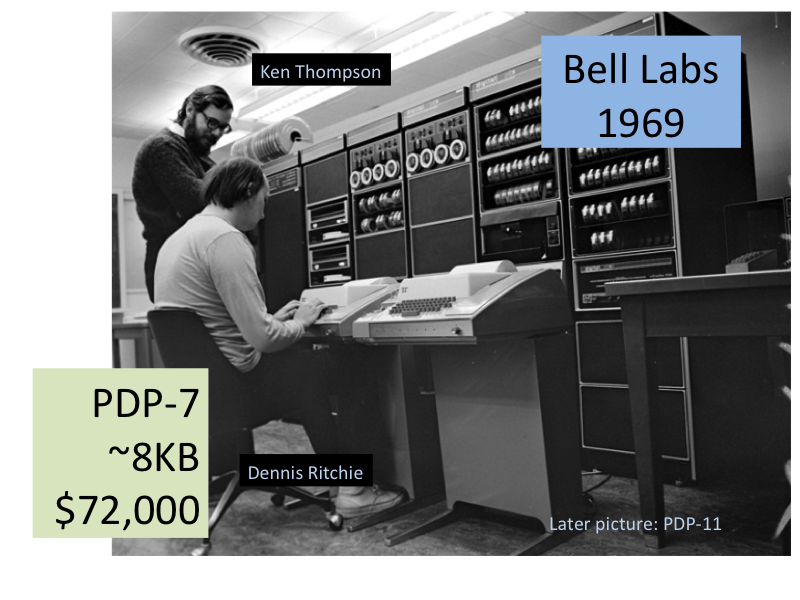 At Bell Labs, Dennis Ritchie and Ken Thompson got access to a PDP-7 and wanted to play a space game they had played on MULTICS (Bell Labs had been a partner for the MULTICS project from 1964-1969) on it. Unfortunately, it only had about 4K of memory, so there was no way to run any of the MULTICS code on it. So, they had to build something much simpler. 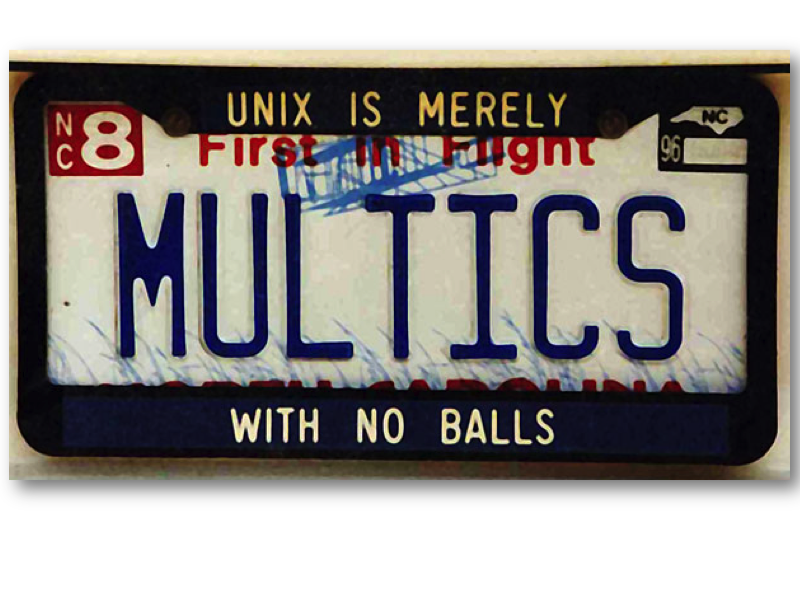 Unix basically gave up almost everything good about MULTICS to fit into the available memory. 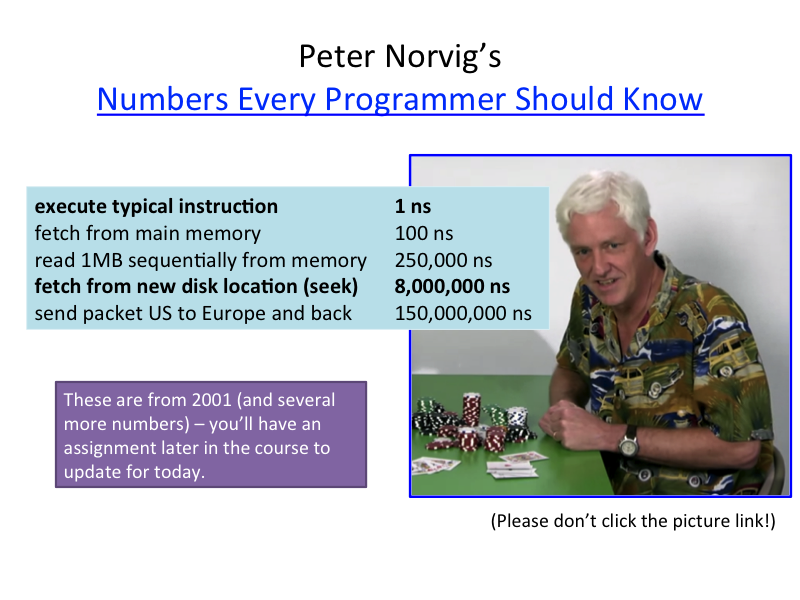 They couldn't even fit the B language on it, so had to invent a simpler language, C, and built a compiler for it (saving space by doing things like changing the assignment operator from the sensible := to the mathematically confusing =, saving hundreds of bytes of storage at the bane of millions of future CS students). But, Unix could run on machines that organizations other than just the Department of Defense could afford! 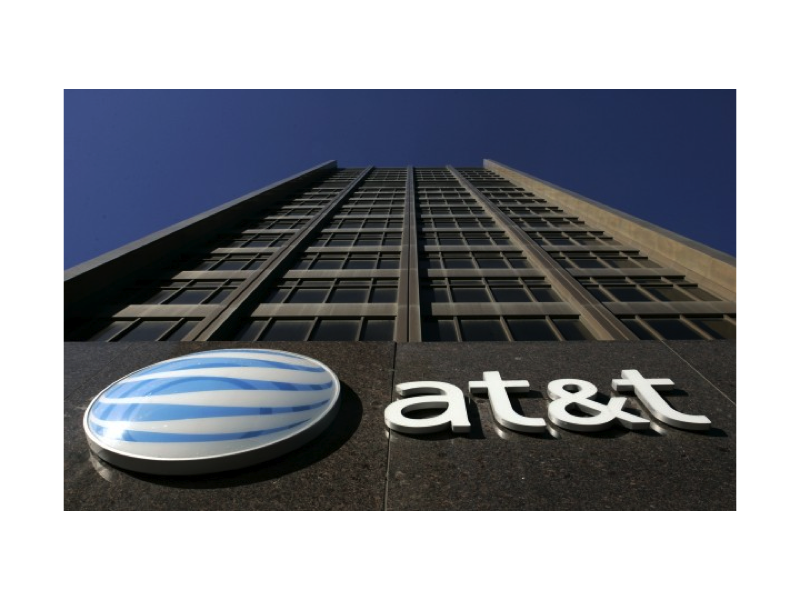 It was even better than that: AT&T was subject to a consent decree to resolve anti-trust issues with their telephony monopoly. They were barred from entering the computer market, and required the license anything they developed to anyone who wanted it. Unix spread like kitkats through academic computer science departments. 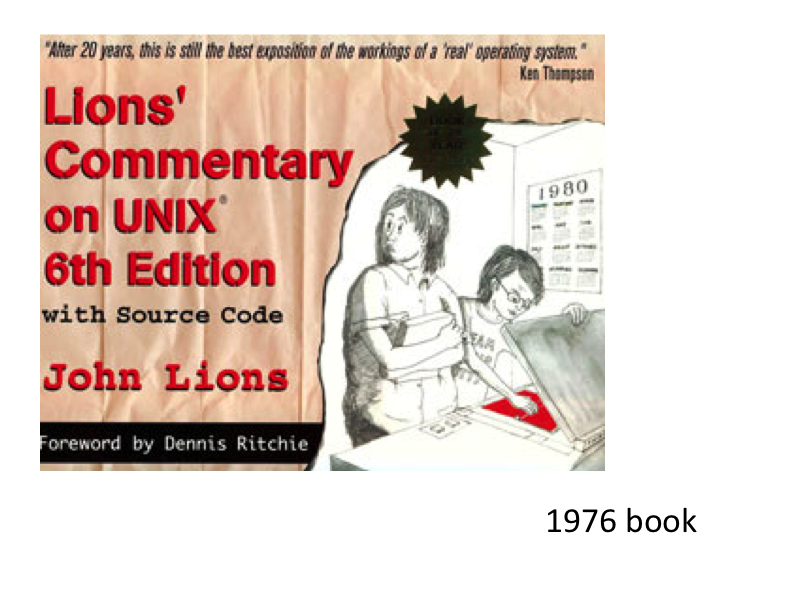 John Lions, an Austrailian professor, wrote a book that explained the Unix source code. 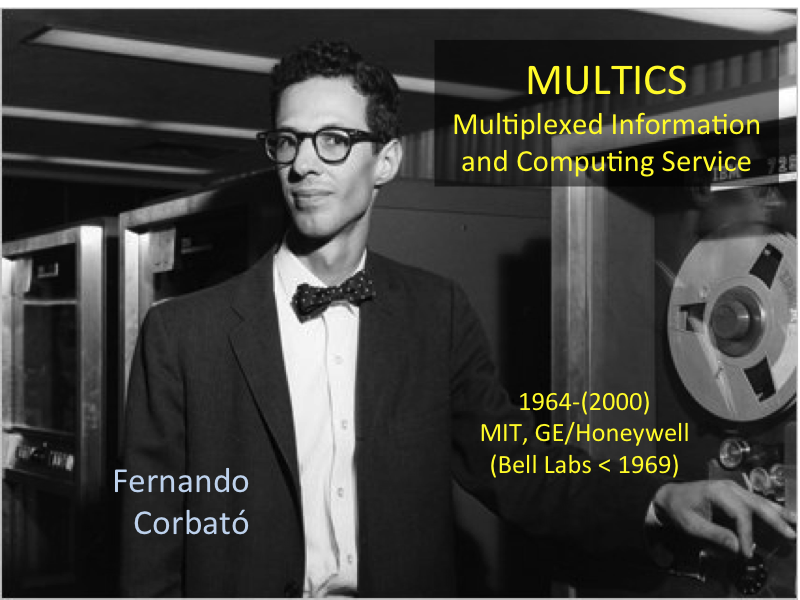 MIT's graduate operating systems engineering course still basically uses it today! By the end of the 1970s, AT&T's legal and business situation had changed, and they decided it was time to try and make some money off Unix. They disallowed using the Unix source code in classes, and blocked the use of Lions' book. People still wanted to teach about operating systems by using actual implementations. 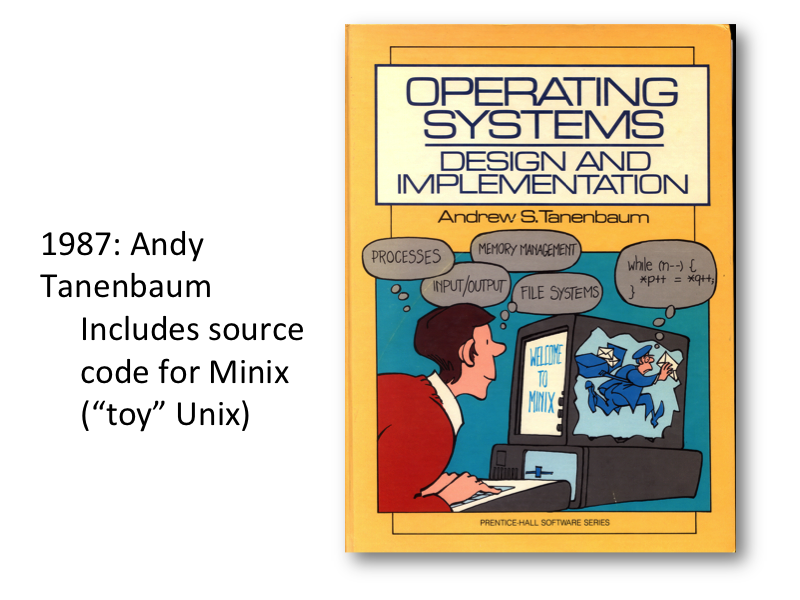 Andrew Tanenbaum wrote a tiny operating system, MINIX, and a textbook including its (copyrighted) source code. 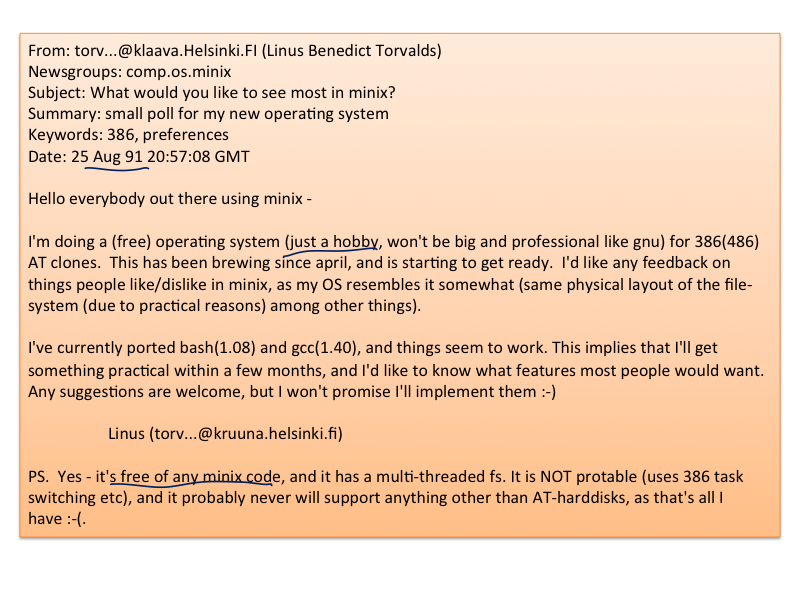 A few years later, a student in Finland got an IBM PC and decided to start writing a new OS as a hobby. 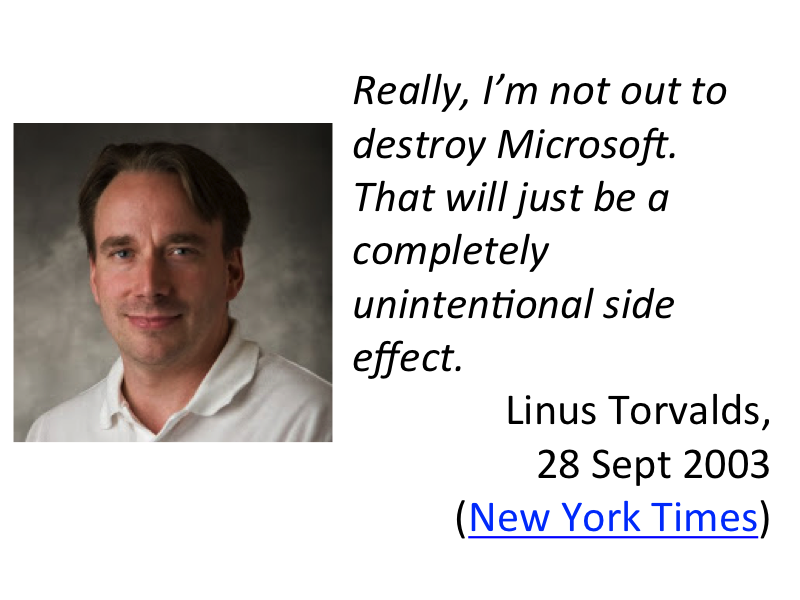 He decided to avoid using any MINIX code, so his hobby system wouldn't be encumbered by any copyrights. Despite some flaws in his design, Linus persisted. We'll talk more about different OS designs in later classes, but the main issue is how much code should be in the kernel, running with the special privileges. 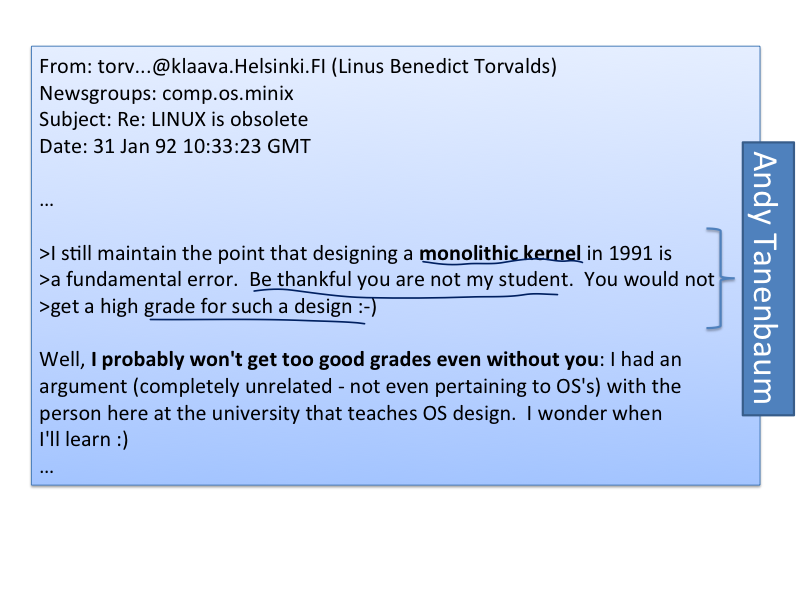 Linux' monolithic kernel runs the entire operating system in supervisor mode, increasing the risk of bugs in code with supervisor privileges. Linux 1.0 was released in 1994 (176,000 lines of C code). It was licensed under an open source license that allows anyone to use and modify the code, including for commercial purposes, so long as they continue to distribute the modified source code. 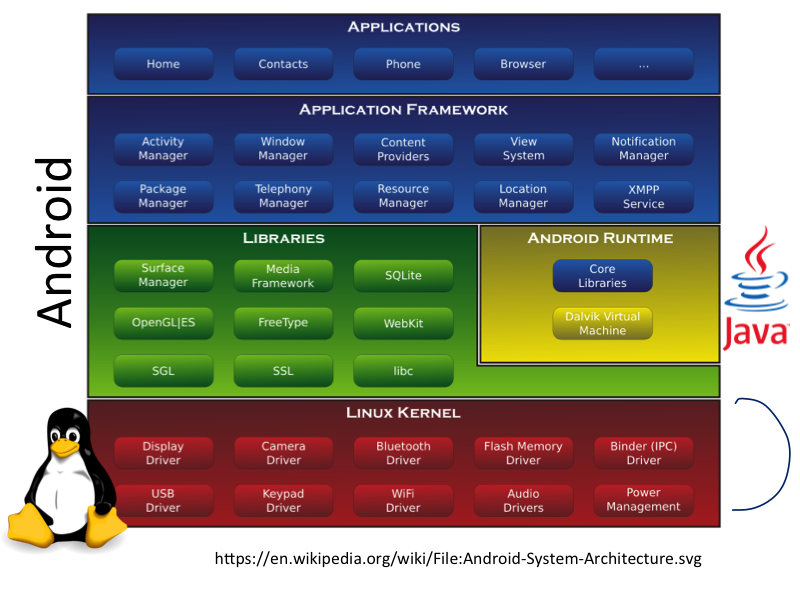 Many developers built systems based on the Linux kernel. 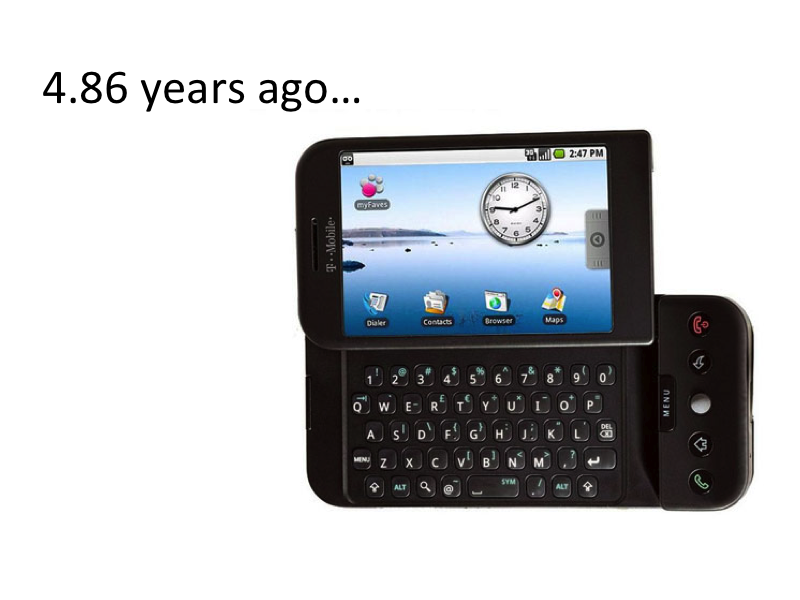 Andy Rubin and colleagues started building an operating system targeted for mobile devices on the Linux kernel starting in 2003, with the goal of building a smartphone OS to compete with Symbian. 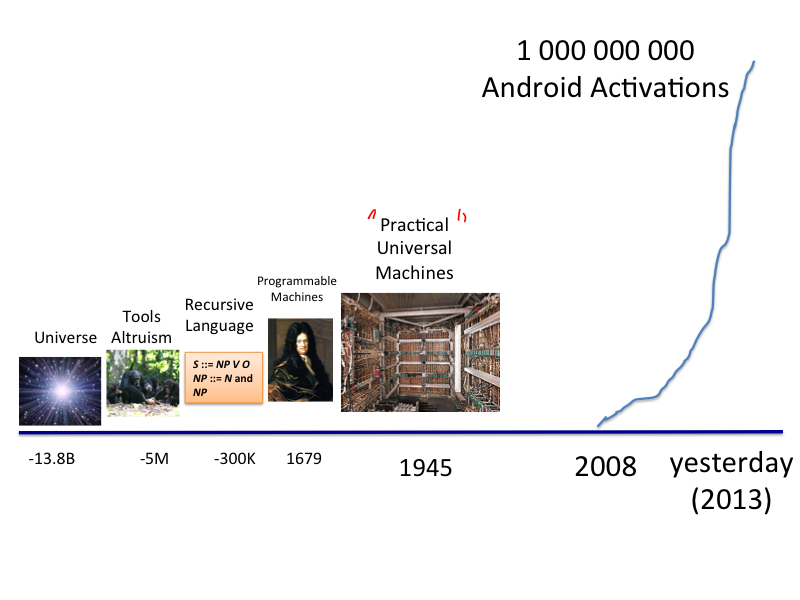 Google acquired Android in 2005. 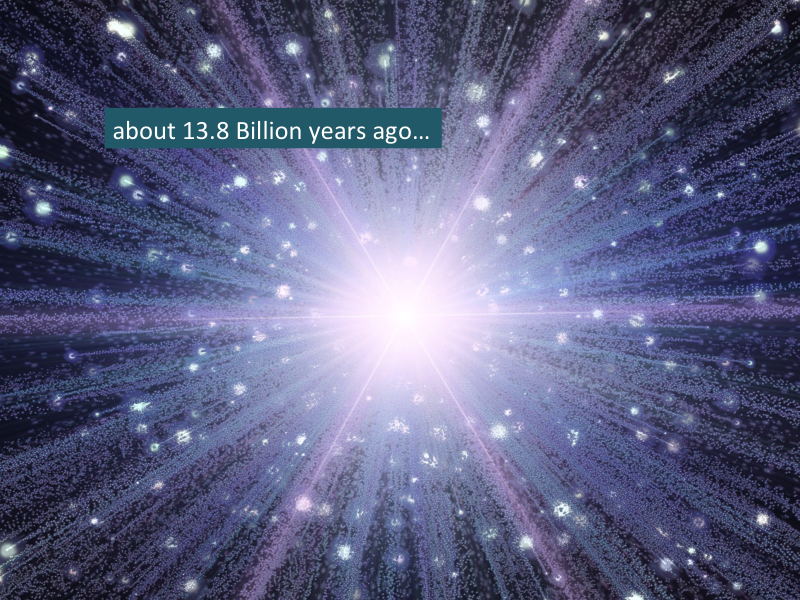 Its been an amazing 13.8 Billion years! 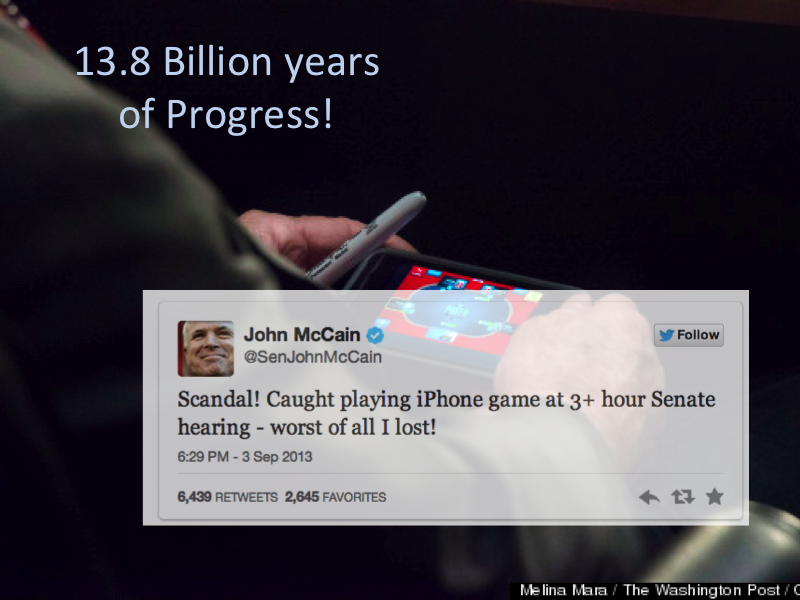 From nothing, to a world where an operating system can be on a billion devices in in five years, and a senator can play on-line poker instead of having to listen to boring discussions about whether or not to bomb other countries. 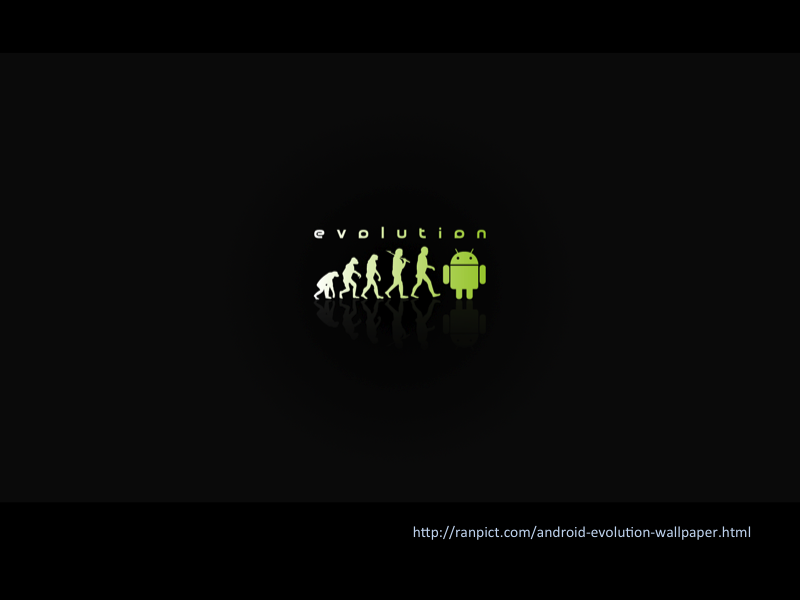 Evolution is often mispresented as an inevitable path of progress leading to the ultimate goal of humanity. Lots of things about our current computing ecosystem seem inevitable and unchangable, but the actual story is much more meandering and serendipitious. Science and engineering play a large and important role, but so do politics, law, marketing, and individual acts of wisdom, kindness, and foolishness. War and scarity are powerful motivators, but in the long run, openness and altruism always win. Its a really exciting time in computing! The next new platform to reach a billion devices should take much less than five years, and we probably haven't yet heard of it. Am I too optimistic? Too pesimistic? Did I miss some important events in this story? Will the next billion-install platform be built by Mozilla, Samsung, or some 19-year old Mumbaikar? Will it be based on an emasculated version of a 1960s system and programmed in a language designed to fit in 4K? Vote in the poll about the playing poker in the Senate picture. Assignments due: Problem Set 1 is due on Tuesday, September 10 (11:59pm).